Aromas of orange blossom and honeysuckle, with just a hint of spicy fresh ginger. Juicy white peach and nectarine fill the mouth and reveal hidden ripe pineapple and guava. This bright fruity wine pairs very well with hard salty cheeses and relaxing on your favorite patio. 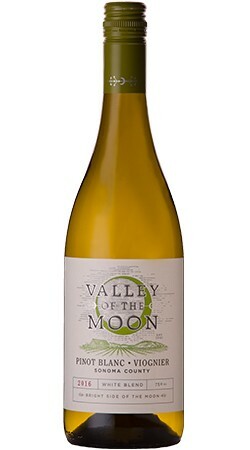 This Pinot Blanc and Viognier blend is cool fermented in stainless steel tanks to preserve all of the fresh fruit and aromas the grapes and yeast have to give. Pinot Blanc is a grape with tropical fruit characteristics that are best kept vibrant by keeping the wine from going through malolactic fermentation. Viognier is known for a lusher mouth feel with floral characteristics. Together these grapes create a glass of wine that is equally at home on a hot summer day or a slightly crisp fall evening.